You can choose whatever service level best suits your needs. Please review our services and rates, and if you'd like a one-time job or commercial service, please request a quote using one of the links below. Thanks! Once signing up for service, one of our technicians will be out initially to do a thorough scoop of your yard. The length of time since your last scoop and the size of your yard will affect the amount of time the technician needs to complete the job. Our technicians drive vehicles with the Doody First logo, so you can always be confident it is one of our staff if you see us around your home. Ongoing, you can expect a technician to arrive sometime between 7:30 – 5:30, Monday-Friday, during your week of service. For those with twice-weekly service, we will arrive on Monday or Tuesday, and again on Thursday or Friday. Upon completion of the scoop, the technician will leave a door-hanger or text notification with a summary of the day’s service. We treat your pets with utmost respect and lots of affection, and keep dog treats on hand to win over even the more stubborn ones. To keep you and your family safe from contamination, we always disinfect our tools in-between jobs. The security of your home and pets is our number one concern when we are performing our service. We are licensed and bonded, and are careful to follow your instructions for entering and leaving the yard. We pride ourselves on our customer service, and want you to feel completely comfortable with our people and satisfied with our service. 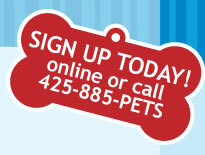 You may reach us by phone any time Monday – Friday from 9AM – 5PM PCT at 425-885-PETS (425-885-7387), and online 24 X 7.